Hunching and poor posture are major problems in this modern age, when people sit for long hours at their desks and contort their bodies to see their computer screens and mobile phones. Texting, whether you like it or not or think about it or not, requires you to look down. The more time spent with your head and neck cast downward, the less your spine is aligned. Text neck is the name given to the development of all neck, spine, and back issues suffered by people who spend too much time on their mobile devices. It may not seem like such a big deal to look down to send a 30-second text, but make this motion often and your joints and muscles will eventually begin to feel the strain and make their discomfort known. Damage to the cervical spine, including malformation in children, can be lifelong, and the most severe cases could lead to early onset of arthritis in the neck. The Pew Research Center reports that young adults ages 18 to 24 send or receive 109.5 text messages, on average, every day. 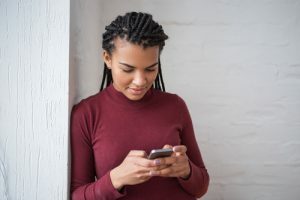 Texting is an easy way to stay in touch, to show emotion (no matter how often it is misinterpreted), and to have a conversation with someone in real time. It’s a successful method of communication, if only it weren’t causing so much pain. The side effects of too much texting are unlikely to be minimized anytime soon. Smartphones aren’t going anywhere. Neck and back muscles will continue to be strained to work at awkward angles. Holding your smartphone at eye level instead of looking down to read or send a text. Lying on your stomach if using your phone for long periods of time. Taking frequent breaks from all electronic devices. Paying attention to your posture. Noticing if your body is in pain and set at an unusual angle. Using voice-to-text options when possible. Preventive measures are the best way to help yourself, rather than allowing your body to fall into chronic pain and being forced to then address the issue. Avoid putting excessive strain on your neck. Build up your core muscles to help support your upper body. Work on neck exercises under the supervision of a qualified functional medicine practitioner. If you’re experiencing back or neck pain of any kind, schedule a consultation with the Restorative Wellness Center in Ann Arbor and talk to Dr. Daniel Geck.